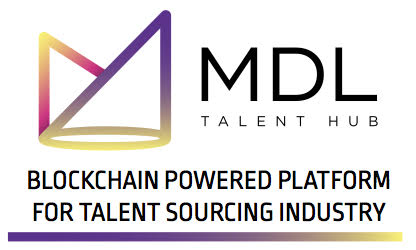 MDL Talent Hub is aiming to build a trustchain for the $2.3 trillion entertainment industry utilizing blockchain and PIDS technologies. The platform will have a prosumer ecosystem marketplace and micro-KOL partnership programs to raise revenue. Resource mining will be enabled via Skyledger. SHANGHAI, December 16, 2017	(Newswire.com) - The success of a promotional event, TVC shooting, or fashion show highly depends on the talents involved. When a big amount of resources is concentrated to push forward a product or an idea, it is absolutely necessary to be able to ensure talents will do their best. On the other hand, talents are often misused, cheated, or simply treated badly. Thus it can be costly and challenging to establish cooperation with professional, well-behaved models, actors, and other types of artists until they are likewise sure that everything will go well. MDL will bring trust to this area! In the long-term perspective, modern technologies are disrupting the economy in ways that leave more and more people unemployed in their professions. Very soon our society will face the momentous shift that will happen when routine physical and even mental human labor are no longer required for advancement. One of the fundamental features of the project is that it will create jobs and give meaning to participants’ lives and lifestyles. Isn’t it nice when people can find a paying audience for their talents and monetize the time they spend on hobbies? MDL will make it easier! MDL Talent Hub will utilize PIDS technologies (IPFS, CXO, etc), which will allow information to be stored in a distributed manner on users’ devices and miners, raising access, speed, and security of information much higher. In order to compensate our users and miners, we will establish bounty program by which anyone can get a certain number of MDL Tokens for storing info about talents, events, and so forth. In order to prepare for the ITO, MDL seeks to raise $500.000. This amount will allow them to launch their ITO campaign in March 2018, where they are expecting to raise $20m for the development of the platform, cross-border scaling and business development, as well as for R&D and further implementation of BC & PIDS technologies. In order to join the Pre-ITO sale which has already started, participants should install Waves wallet. During the Pre-ITO in January 2018, MDL will distribute 50% of the total amount, which is 50,000,000 tokens, at an average price of $0.01. The Pre-ITO will last for four weeks and the Token price will be 5x up during ITO in March. MDL is the source of this content. Virtual currency is not legal tender, is not backed by the government, and accounts and value balances are not subject to consumer protections. This press release is for informational purposes only. The information does not constitute investment advice or an offer to invest.